Although this is a simple drill, its a great footwork drill that is a great starting point for getting players to lock in on ball security, keeping their eyes up, and training their feet to work without having to look down. A classic RB drill. The Hop and Switch Drill has probably been seen by all coaches before, it is a classic yet useful RB drill that emphasizes ball control and switching hands while also coaching balance and athleticism. No video for this simple drill but another great ball security drill for ball carriers. Essentially you take half of your backs and make them ball carriers whereas the other half will serve as the “trailers”. RB’s will take off on the whistle or cadence at about 60-70 percent and then pick up speed when they feel a “punch” or “rip” of the ball from the trailer behind them. The drill can start slower to teach technique and get guys acclimated. Trailers should be coached to make the ball carriers work. Advancing the drill a step further, coaches can make “switch” calls to challenge ball carriers to securely switch the ball in the open field. Come on, you knew it was coming! Bag drills are basically THE epitome of running back drills. Here is the one foot in each hole bag drill. This is typically the first of a series of movements that ball carriers will perform through the bags. Coaching points include driving knees up and forward, eyes up, ball secured and tight, shoulders low. To advance the drill a step further have a coach with a bag or hand shield prod or attack the ball carriers with occasional jabs at the football. The Shuffle and Switch Drill takes our bag series a step further and has running backs shuffle through each opening of the bags and switch the ball on each cut. Typical coaching points here of ball security, sharp cuts, low shoulders, etc… Add the coach with a bag or hand-shield for advanced ball security work. Adding on to our popular bag series, we add the “spring and back-pedal drill”. 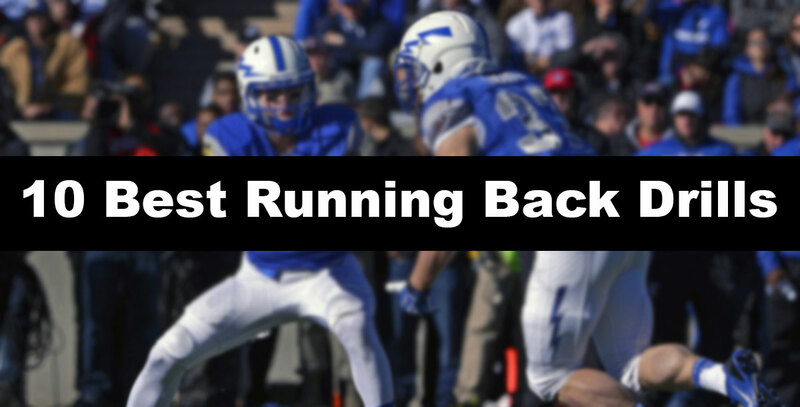 Although it may seem counterintuitive to have running backs working on moving backwards, this is an effective drill because it helps players on their footwork and also it causes ball carriers to have to explode out of their back-pedal into a sprint. Change of speed is the key emphasis here. A very popular drill among running back coaches everywhere, the gauntlet drill is an effective drill that simulates backs running through an open hole and avoiding arm tackles. Ball security is another coaching point here, as well as acceleration through the bags, some backs may slow down while going through the gauntlet. A close second to bag drills, ladder drills are a hit with most running back coaches and are utilized almost daily at practice. There are a number of movements in a ladder series that coaches can utilize in their EDD’s (Every Day Drills). Check out a couple of movements that NFL RB Christine Michael utilizes, here. The last drill in our top ten list is probably the most advanced but it can be learned pretty easily with repetition. This drill potentially simulates a ball carrier cutting the best. 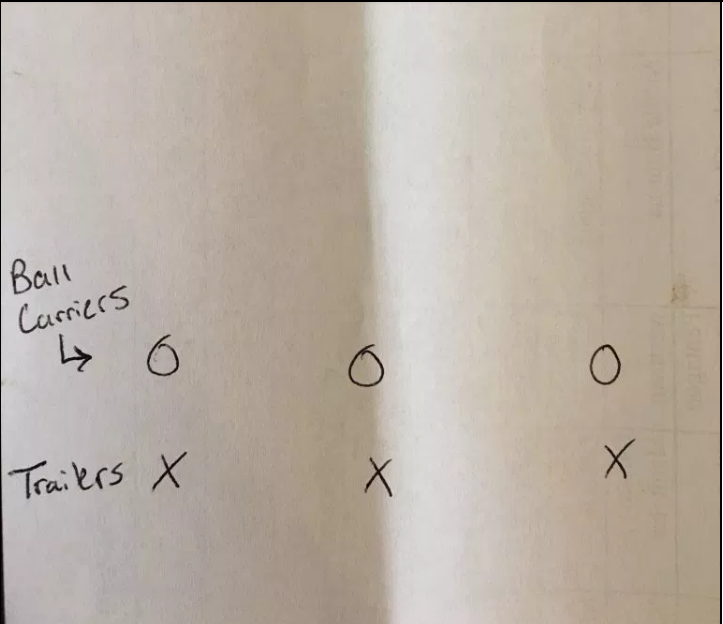 The ball carrier will attack the “T” on one side, step over horizontally, step over vertically, attack the coach down field (in black shirt), and make a final cut off of the coaches movement. This is my personal favorite RB drill because it creates a game-like scenario in the way it has backs attack a hole, make a cut in the box and then make another cut downfield.